Well that was a busy weekend. I just spent the past three days making a video game, and it turned out better than I was expecting. This past weekend was the Ludum Jam (or Ludum Dare if you follow some different rules), a video game making competition. The rules are pretty simple: you have 72 hours to make a video game based around a theme that they supply. You can work on a team, and pretty much anything goes. My roommate and I are both graduating this semester and we have officially finished classes, so we we figured "what the heck, why not?" and just went for it. The competition started on Friday at 8pm, and ended on Monday at 8pm. Of course, even though the whole competition is 72 hours long, we didn't work on the game for all of that time. We took a lot of breaks, and slept in, and went to church, and watched movies (specifically The Lego Movie, which is absolutely fantastic and one of my favourite movies ever now), and all sorts of other fun stuff. We just also devoted a chunk of spare time to writing a video game. All told, we probably only spent 18-20 hours making the game, but even still we ended up with a pretty complete final product. 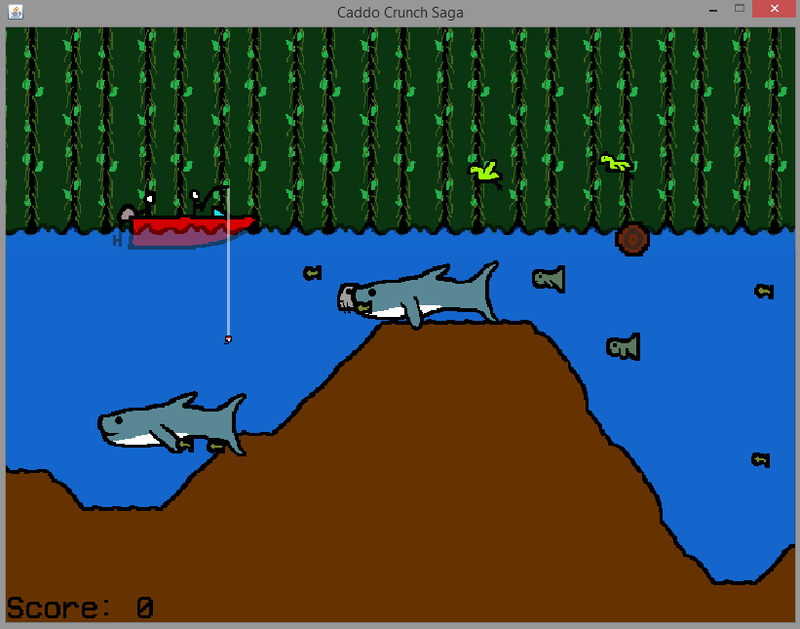 The game is called Caddo Crunch Saga because the basic premise is that you are fishing from a boat in Caddo Lake, pretty much the only natural lake in Texas. The theme for the Ludum Jam this time was "Beneath the Surface," so it seemed like fishing was appropriate. Four years ago, when we first got here, our adoptive family took us out to Caddo Lake and jokingly suggested that we make a video game about it. This year, we decided that we would actually do just that, and Caddo Crunch Saga was born. As much as the name may sound like certain other intellectual properties, it has nothing to do with them (as you can tell by the above screenshot). The goal of the game is to catch as many fish as you can for the highest number of points while not having them eaten by alligators or birds and not crashing your boat into a log. It's pretty much exactly accurate to every fishing trip that I've ever been on, let me tell you. Probably the best part of this whole experience was just working on a small two man team with Dagger. We've been roommates for two years and were even on the programming team together (and went to Russia together), but somehow we've never really worked on a full project like this before. We make a pretty good team, if I do say so myself, and I think that the fact that we pulled this game off in the time that we did shows that to be true. We were able to partition the work efficiently, make decisions, and get things done quickly. Plus, the fact that there were only two of us meant that we both got to work in every area, at least a little bit. In any case, I present to you Caddo Crunch Saga, the epic quest to catch the most fish in the lake. You can check out our Ludum Jam page here (I don't know if you can vote for us, but you can try if you want), and you can download the game here if you want to try it out for yourself. You'll need Java installed to play the game. Quick controls primer: left and right arrows move the boat, up and down arrows moves the lure, and the space bar makes the boat jump (for dodging logs). If your bait is eaten, you'll need to pull the lure back up to put a new worm on it. It's not perfectly balanced, but it should still be enjoyable. Good luck, and have fun!